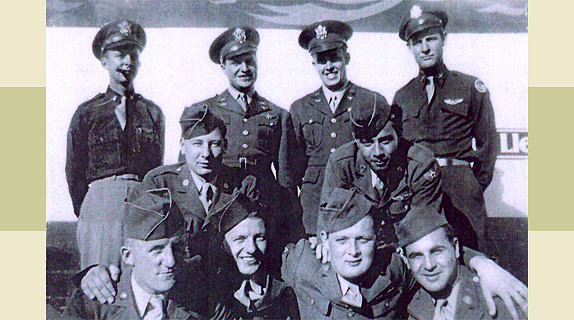 The Uebelhoer Crew was one of the original crews for the 492nd BG that trained in Alamogordo, New Mexico. They transferred in as crew 1660 from the CCTS (Combat Crew Training School) in Biggs, Texas, on 3 Mar 44. They were assigned to the 859th BS, designated as Crew 904. Capt Wilbur Uebelhoer signed out for a B-24J 44-40069. In April 1944, they flew their assigned aircraft to North Pickenham, England, via the southern route. Their ground crew chief S/Sgt Bliss flew with them, thus bumping Cpl Cabral onto the Queen Elizabeth. While surfing the net for pieces of history, we found this Crew's original plane listed with the 389th BG with the name, LITTLE RED. We were assuming that the salvaged plane went to their airfield. We haven't heard or read anything that supports this plane ever having a nickname, but we couldn't imagine a salvage officer naming wrecks. We elected to post the name LITTLE RED here, in hopes that someone may be able to provide us with more information. Since our finding the name, the 389th website has taken the name and plane off their list. By our count, Capt Uebelhoer flew as the aircraft commander for Crew 904 for a total of 6 missions and an aborted one. We can't be positive of all of the personnel changes on some of their missions. It's always possible that the bombardier could have missed some of the earlier pathfinder missions. The Crew's first mission was perhaps the roughest they had with the 492nd. It was the Group's maiden mission. A couple of things happened. First, the Group couldn't identify their primary target due to bad intelligence. Too much time was wasted in trying to find it before running off to the secondary target. As a result all of the planes were coming back low on fuel. If that's not bad enough, the Uebelhoer Crew lost an engine on the return trip. The additional drag caused the ship to burn even more fuel. They ran out of gas just as they got across the channel and crashlanded it near Wittering, Sussex. Amazingly the whole crew was able to walk away from it. On 10 Jun 44, the Ubelhoer Crew was transferred to the 44th BG for lead crew training on Pathfinders. Their transfer order carried an extra bombardier, perhaps as a pilotage navigator, Lt Williams from the Ogden Crew 606. After a short time with the 44th, they were reassigned to the 445th BG where they completed their tour. While serving with the 445th, they were among the few who had survived the Kassel mission. On that mission, the 445th sent out 35 planes on a milk run only to have 4 return to base. For more details see our Web Links. Page last modified Tuesday, December 29, 2015.